We've hit that dull point in the year where winter isn't quite over, and spring has yet to show any real promise that it's here to stay. I start getting anxious about now for my garden. wishing that I could just go drop a few seeds in the earth, but I know much better than that. One of the things that keeps me preoccupied during the winter months is sprouting seeds in my kitchen. At first I was buying my sprouts at a local health food market because they're delicious...but then I realized how simple they must be to grow. There are many methods for spouting, from canning jars to expensive sprouting systems, but I wanted something that looked pretty on the counter top in the kitchen, and I thought "what better than a fancy cake plate?" Of course, you could keep them in any room in your house, but my kitchen happens to be where the most sunlight is. To make a sprouter of your own, you only need a few simple things. First take the chair pads, and stick them to the plate as far out as they'll go, or where ever the dome rests. The purpose of these is so that the dome doesn't close all the way down-the seeds need a bit of air circulation, otherwise they can mold. Next, trace your dome onto your screening. Now, with a strong pair or scissors, cut inside your trace mark by at a least a centimeter. You need it to be slightly smaller than your dome, so that it fits inside. Once it's cut out, carefully bend the your screen edges up. This will provide a bit of an edge for your seeds, so they don't escape when you rinse them. Place the screening in your cake plate and close the dome, and you're set. You can trim the edge with ribbon if you don't want the screen to show. Once those sprouts start growing though, you'll hardly notice the screen. All there is left to do now is decide which seeds you'd like to sprout! Depending on what you choose, you'll need to either soak your seeds before sprouting, or just give them a first rinse. For sunflower seeds, I soak them for two hours, and then place them on the screen, trying to get them evenly separated. You don't want your screen packed with seeds, but you can get quite a few on. Once they're on the screen and wet, you can put it back under the dome and leave them. Each day, they'll need rinsed twice. I rinse them around noon and again at night before I go to bed. We start snacking on ours once they're about 2 inches long (about 5 days sprouted.) You can let them get much longer though if you like. And remember, the entire sprout is edible, both the root and the shoot. Somewhat oddly, I like them as they are, along with a pear with some black pepper& balsamic vinegar. I'd love to hear how your sprouter turns out! Clever, practical and gorgeous! If you only ever grew the sprouts for show, it's well worth it. 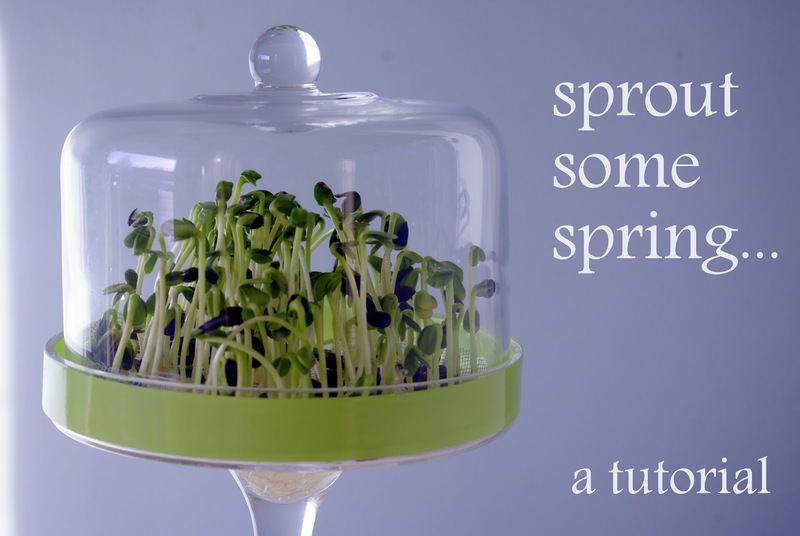 Just remember to get seeds specifically for sprouting and eating. Other seeds can be treating with growth hormones and stuff you shouldn't be eating. Bags of sprouting seeds are pretty cheap at most health food stores (Goodness Me! locally). I think sprouting seeds are actually cheaper than planting seeds! You are incredible! This is gorgeous and so smart. And I really want that cake stand...is it thrifted? Yes- it was thrifted! $3 BUCKS!